My brother-in-law Nathan suffers from cystic fibrosis, an inherited chronic disease that affects the lungs and digestive system of about 30,000 children and young adults in the United States (and 70,000 worldwide). In the 1950s, few children with cystic fibrosis lived to attend elementary school. Since that time, thanks to advances in research, significant progress has been made in the form of innovative medical treatments resulting in the enhanced and extended life for children and adults with CF. That said, the battle is far from won. The average life expectancy for a child diagnosed with CF today is just 37 years. But it’s not all doom and gloom for those who suffer. There is ample evidence suggesting that an active lifestyle can go a long way in prolonging the later stages of CF. 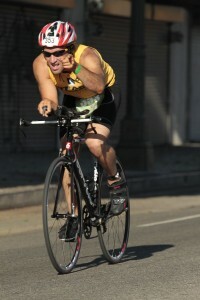 A few years ago, I watched in awe as my brother-in-law Nathan began embarking on the goal of becoming a triathlete. Soon he was able to swim, bike and run faster and longer than other athletes with twice his lung capacity – a true testament to how high we all can climb with the right amount of determination and will. Now (and for those who know me well this should come as no surprise), I’ve never been much of an all-star athlete. And when it came to endurance specifically, I was the guy who took the elevator up one floor while stairs were readily available and encouraged. 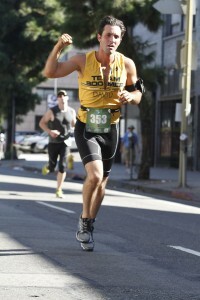 But as I began to hear and watch of Nathan’s amazing training progress it truly inspired me. In October of last year, my sister gave birth to a perfectly healthy, adorable baby boy (Luke Grayson). Having to juggle the responsibilities of a newborn son, Nathan decided it was best to hang up the wetsuit and bike spandex for the time being while he focused on tackling the demands of fatherhood. It was in his honor that I first became involved in the sport of organized triathlon events, racing with Team Boomer and fundraising through The Boomer Esiason Foundation. To learn more about David Gray and his dedication to the Team Boomer cause, visit his First Giving page.